Prohibition Agent Charles Foster Cooley, Jr., was driving to Malvern, AR, to appear as a witness in a State liquor case. As he reached the top of a high grade on the public highway, two vehicles approached, one trying to pass the other. In order to avoid a head-on collision, Agent Cooley was forced to go into a ditch, but his car skidded and flipped over. Agent Cooley was killed instantly. 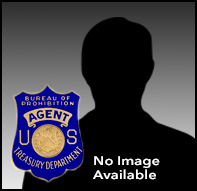 Agent Cooley joined the Prohibition Unit on April 13, 1922. Previously, he was a deputy sheriff in Arkansas. Agent Cooley proudly served in the U.S. Army during the Spanish-American War and also in World War I. Agent Cooley was born in Fredonia Station, WI. He was single.